The feeling is mutual as the “Twilight” sensation kisses the trunk of Tai during our pictorial with both of them in the parking lot of the Fairmont Miramar Hotel in Santa Monica. Based on Sara Gruen’s 2006 novel of the same title, the movie is about Jacob Jankowski (Robert), a vet student, who falls in love with The Benzini Bros. Circus’ star performer, Marlena (Reese Witherspoon), who is married to the controlling ringleader and circus owner, August (Christoph Waltz). Jacob and Marlena become closer to each other when both take care of Rosie the Elephant (Tai) who is nearly nine feet tall. 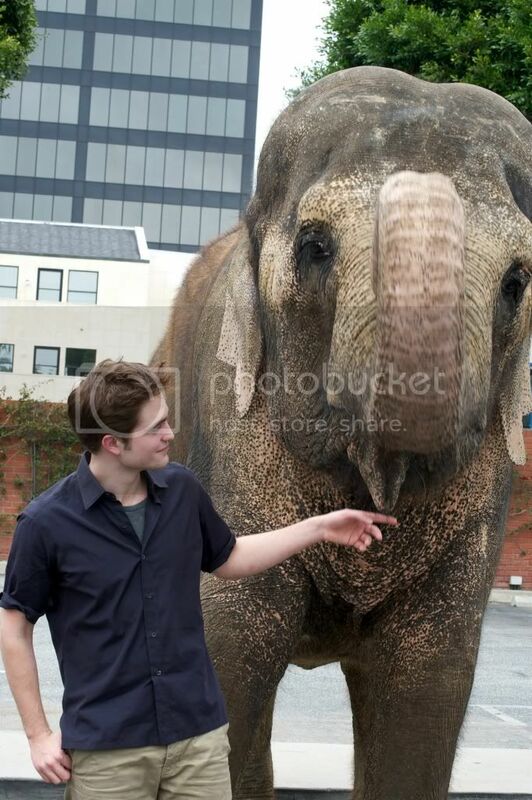 Robert admitted that working with animals gave him a different perspective on animals. “It’s definitely a totally different experience being on a set where there are a lot of animals,” he revealed. “There’s a calm that it creates. People are a lot happier. Nobody was complaining about anything every single day. I guess it provides a perspective on what you’re doing when you see an elephant that is just kind of content with pretty much anything if you give him some food. I treat animals in many ways the same as I treat people. I’ve met a bunch of new people on the job. God, that sounds like I’m completely insane.” He laughed. With the last installment of the “Twilight” series almost over, Robert revealed he would love to have more control over the jobs he do. “I hope my career will allow me to do that as I get older,” he confessed. Reese Witherspoon, who just got married to agent Jim Toth in a private ceremony at her ranch estate in Ojai, California, revealed that she wore a classic Monique Lhuillier wedding gown at her wedding. Her daughter, Ava Elizabeth Phillippe, also wore a Monique Lhuillier creation at her wedding. Reese also changed into another Monique Lhuillier dress for her wedding party. As for working with Robert, Reese said, “When you work with Rob, there are lots of paparazzi and lots of fans around and they were showing up in buses like literally on the set. I’ve never seen anything like it. It’s definitely a phenomenon that I haven’t seen this amount of attention or excitement about an actor in a really long time. Before I met him, I wondered how he handled his popularity. I didn’t have that kind of instant popularity. It built slowly for me. The loss of privacy is always difficult.